1 If you've ever seen a stag beetle, you might think that it's a dangerous bug. 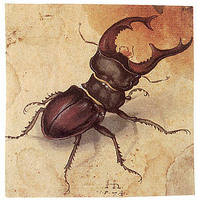 The stag beetle looks like it has antlers sticking out from its head. Those antlers are mandibles, or jaws, and they do look scary. But stag beetles really aren't harmful to people. They don't bite. 2 The male stag beetle uses its jaws to scare enemies and to fight other stag beetles. The jaws don't really do much damage. The stag beetle uses its jaws to flip another beetle over on its back. The fight is a fight that tests how strong the stag beetles are. The winner is the stag beetle that can outlast the other one. The female stag beetle has smaller jaws. She uses her jaws to dig holes in which she can lay her eggs.